Sharp LC-70LE741E review | What Hi-Fi? We understand if you have to take our word for it on this one, but suffice to say that somehow a 70in TV seems a heck of a lot bigger than a 65in TV. We’ve become strangely accustomed to the likes of 50in+ sets in recent years, and have to consciously remind ourselves how big these TVs are when it comes to testing. Remembering what we have room for in our own homes normally does the trick. But with a 70in TV such as this Sharp LC-70LE741E (a suitably large model name), we don’t need reminding. And yet, check out the price. Sharp is no stranger to supersize screens – it commands a dedicated section on the Sharp website, no less – but last time we saw a 60in set, a relative minnow, it had a price tag of £3300. So even as we heave it out of the box/small shed in which it’s delivered, we’re thinking this 70in LCD TV has the potential to be something of a steal. Hats off to Sharp for managing to make this massive TV so presentable. It's a little fatter than the super-slim screens we might be used to of late, but it's still pretty thin and also sports a bezel as slight as the average out there. Given that it sits on a standard pedestal stand, we're a little bemused that you can't rotate the screen but figure it's most likely that that the majority of buyers will get this set mounted on a wall. With the Sharp weighing in at 56Kg, just make sure it's a strong one. The chassis is chunkier than that of the average set, unsurprisingly, measuring nearly 9cm in depth – without which you might worry about its stability in high winds. Inside, there’s everything you’d expect in a TV in 2012. 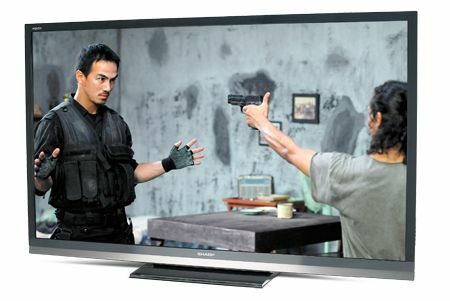 It’s a full HD resolution, active-shutter 3D TV, with edge LED backlighting. There’s a Freeview HD tuner, four HDMI inputs, two USB inputs, and the option of wired or wireless internet connectivity. Connect to your network and as well as DLNA streaming of your own content you can access Sharp’s Aquos Net+ content portal. Sadly, the selection here is a little limited: there’s no BBC iPlayer nor any catch-up TV service, and the only video content comes from YouTube and the not-particularly-well-stocked Box Office 365 and Viewster. That said, there is Aupeo! internet radio and the iConcerts pay-as-you-go live music app, which also has a wealth of free content. It has to be said: moving around the Sharp’s interface, and between sources, could be slicker. The TV is sluggish to react to commands and neither the main home menu nor the EPG gives you an in-picture view of the live TV screen, which is a little frustrating. The Sharp remote looks fairly ordinary but is slim, lightweight and pretty simple to get your head around. Sensibly, the main buttons are grouped together towards the bottom, within thumbing distance, with the volume and channel controls just above. With all that said, our main issue is with the sluggishness of responses to button presses. It’s most notable when changing channels, skipping up and down taking a good few seconds. A similar pause is required if you want to scroll through a series of channels. The main home button takes you to a smart-looking home screen. Icons here allow you to access the TV's key features. Strangely, you seem to have to come through this screen to access the picture settings, which, by contrast, use a tired-looking set of scrolling menus. Talking of which, the EPG doesn’t look too easy on the eyes, either. There’s no picture-in-picture option so you can’t keep an eye on EastEnders as you see what’s on later, and the chosen font and general mass of text makes for a pretty ugly experience. That said, it is just a button press away, getting its own dedicated key on the remote. Still, once you’re settled on some content, the quality of the picture goes a long way to making up for it. Watching the Freeview tuner, colours are vibrant, black levels are solid, and there’s good attention to detail. Standard definition channels hold up well to being upscaled to fit the 1920 x 1080 resolution screen, while switch to HD and the picture sharpens and looks clean. Watching DVD or Blu-ray discs you don’t quite get the contrast levels of some (smaller) screens and fast motion isn’t rock solid, but it’s still an enjoyable picture, remaining largely free from noise and instability, and delivering punchy colours. You’ll have to buy the USB rechargeable 3D glasses separately, but do so and it’s more of the same as far as the extra dimension's concerned: we do notice the motion issues, but there’s decent depth and the rest of the picture is pretty strong. The size does matter – we can’t help but be drawn to watching everything in super-size when the quality’s good. Remind yourself of the price, and you’ll realise why we think this TV is a real steal.